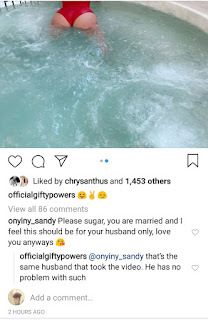 Big Brother Naija's Gifty, who claims she's married, has said that her husband has no problem with her dressing scantily and displaying her body on Instagram. The follower told her that she should cover up now that she's a mother and a wife. But Gifty replied, saying it was her husband who took the video and he is Ok with her showing off her body.